APK Signature Scheme v2 is a whole-file signature scheme that increases verification speed and strengthens integrity guarantees by detecting any changes to the protected parts of the APK. Signing using APK Signature Scheme v2 inserts an APK Signing Block into the APK file immediately before the ZIP Central Directory section. Inside the APK Signing Block, v2 signatures and signer identity information are stored in an APK Signature Scheme v2 Block. APK Signature Scheme v2 was introduced in Android 7.0 (Nougat). To make a APK installable on Android 6.0 (Marshmallow) and older devices, the APK should be signed using JAR signing before being signed with the v2 scheme. To maintain backward-compatibility with the v1 APK format, v2 and newer APK signatures are stored inside an APK Signing Block, a new container introduced to support APK Signature Scheme v2. In an APK file, the APK Signing Block is located immediately before the ZIP Central Directory, which is located at the end of the file. The block contains ID-value pairs wrapped in a way that makes it easier to locate the block in the APK. The v2 signature of the APK is stored as an ID-value pair with ID 0x7109871a. APK is parsed by first finding the start of the ZIP Central Directory (by finding the ZIP End of Central Directory record at the end of the file, then reading the start offset of the Central Directory from the record). The magic value provides a quick way to establish that what precedes Central Directory is likely the APK Signing Block. The size of block value then efficiently points to the start of the block in the file. ID-value pairs with unknown IDs should be ignored when interpreting the block. (signature algorithm, digest, signature) tuples. The digest is stored to decouple signature verification from integrity checking of the APK’s contents. X.509 certificate chain representing the signer’s identity. Additional attributes as key-value pairs. For each signer, the APK is verified using a supported signature from the provided list. Signatures with unknown signature algorithms are ignored. It is up to each implementation to choose which signature to use when multiple supported signatures are encountered. This enables the introduction of stronger signing methods in the future in a backward-compatible way. The suggested approach is to verify the strongest signature. APK Signature Scheme v2 Block is stored inside the APK Signing Block under ID 0x7109871a. 0x0103—RSASSA-PKCS1-v1_5 with SHA2-256 digest. This is for build systems which require deterministic signatures. 0x0104—RSASSA-PKCS1-v1_5 with SHA2-512 digest. This is for build systems which require deterministic signatures. All of the above signature algorithms are supported by the Android platform. Signing tools may support a subset of the algorithms. APK Signature Scheme v2 protects the integrity of sections 1, 3, 4, and the signed data blocks of the APK Signature Scheme v2 Block contained inside section 2. The integrity of sections 1, 3, and 4 is protected by one or more digests of their contents stored in signed data blocks which are, in turn, protected by one or more signatures. The digest over sections 1, 3, and 4 is computed as follows, similar to a two-level Merkle tree. Each section is split into consecutive 1 MB (220 bytes) chunks. The last chunk in each section may be shorter. The digest of each chunk is computed over the concatenation of byte 0xa5, the chunk’s length in bytes (little-endian uint32), and the chunk’s contents. The top-level digest is computed over the concatenation of byte 0x5a, the number of chunks (little-endian uint32), and the concatenation of digests of the chunks in the order the chunks appear in the APK. The digest is computed in chunked fashion to enable to speed up the computation by parallelizing it. Protection of section 4 (ZIP End of Central Directory) is complicated by the section containing the offset of ZIP Central Directory. The offset changes when the size of the APK Signing Block changes, for instance, when a new signature is added. Thus, when computing digest over the ZIP End of Central Directory, the field containing the offset of ZIP Central Directory must be treated as containing the offset of the APK Signing Block. An attacker could attempt to have a v2-signed APK verified as a v1-signed APK on Android platforms that support verifying v2-signed APK. To mitigate this attack, v2-signed APKs that are also v1-signed must contain an X-Android-APK-Signed attribute in the main section of their META-INF/*.SF files. The value of the attribute is a comma-separated set of APK signature scheme IDs (the ID of this scheme is 2). 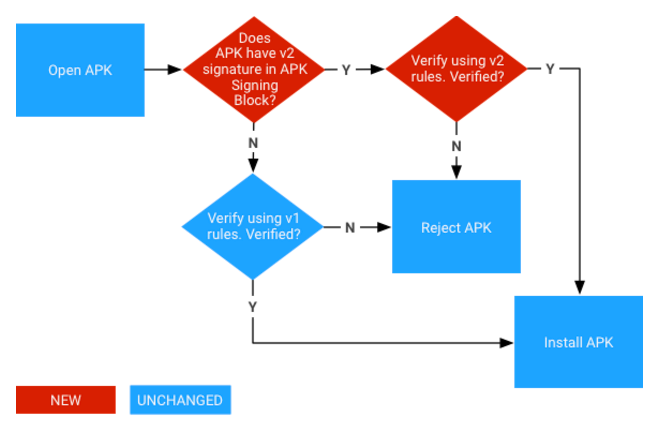 When verifying the v1 signature, APK verifier is required to reject APKs which do not have a signature for the APK signature scheme the verifier prefers from this set (e.g., v2 scheme). This protection relies on the fact that contents META-INF/*.SF files are protected by v1 signatures. See the section on JAR signed APK verification. An attacker could attempt to strip stronger signatures from the APK Signature Scheme v2 Block. To mitigate this attack, the list of signature algorithm IDs with which the APK was being signed is stored in the signed data block which is protected by each signature. In Android 7.0 and later, APKs can be verified according to the APK Signature Scheme v2+ or JAR signing (v1 scheme). Older platforms ignore v2 signatures and only verify v1 signatures. Locate the first APK Signature Scheme v2 Block inside the APK Signing Block. If the v2 Block if present, proceed to step 3. Otherwise, fall back to verifying the APK using v1 scheme. Verification succeeds if at least one signer was found and step 3 succeeded for each found signer. Note: APK must not be verified using the v1 scheme if a failure occurs in step 3 or 4. Each signer is represented by a META-INF/<signer>.SF and META-INF/<signer>. (RSA|DSA|EC) JAR entry. <signer>. (RSA|DSA|EC) is a PKCS #7 CMS ContentInfo with SignedData structure whose signature is verified over the <signer>.SF file. <signer>.SF file contains a whole-file digest of the META-INF/MANIFEST.MF and digests of each section of META-INF/MANIFEST.MF. The whole-file digest of the MANIFEST.MF is verified. If that fails, the digest of each MANIFEST.MF section is verified instead. META-INF/MANIFEST.MF contains, for each integrity-protected JAR entry, a correspondingly named section containing the digest of the entry’s uncompressed contents. All these digests are verified. APK verification fails if the APK contains JAR entries which are not listed in the MANIFEST.MF and are not part of JAR signature. The protection chain is thus <signer>. (RSA|DSA|EC) -> <signer>.SF -> MANIFEST.MF -> contents of each integrity-protected JAR entry.